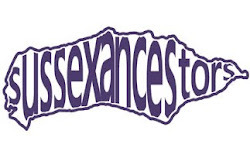 Sussex Ancestors: A little too large! As the librarian for the Sussex Family History Group I am currently sorting through a lots of boxes which haven't been opened for some time. The latest box included a transcript of a press cutting of the burial of William Agate in Horsham in 1827. 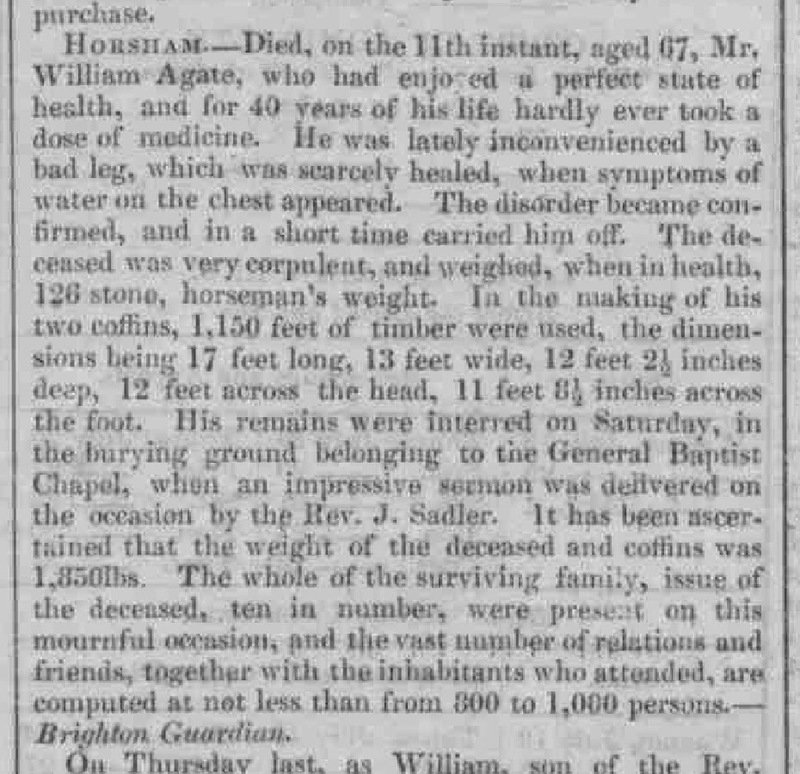 According to this report, when William Agate died he was 'very corpulent' and weighed 126 stone. Some internet research suggests that 126 stone was probably an exaggeration as even in our obese world people weighing 100+ stone are rare although obesity is not a problem limited to our century, it existed in 18th centuries onwards amongst the wealthy and middle classes who had access to foods in excess. William was actually described as being 126 stone 'horsemans weight'. This does not mean William was the right weight to ride a horse (if he did weigh 126 stone he would have been the same weight as a fairly large horse!) instead it is to do with how the value of a stone was calculated. Back in the Middle Ages there was no standardised 'stone' weight and each community would use a rock or stone of about the right weight to measure out each sale but with the growth of international trade a stone was fixed at a specific weight - but at a different weight depending on the item. A stone of wool was 14lbs, whilst a stone of wax was 12lbs and a stone of sugar weighed 8lbs. A horsemans weight meant that a stone weighed 14lbs (as it does now) so according to the London Express of the 19th July 1827 William Agate weighed 126 stone or 1,764lbs (800kgs). If his weight was exaggerated then hopefully the size of his coffin was too as the article says it was 17ft by 13ft and 12ft deep. The General Baptist church graveyard in Horsham is not the biggest and a coffin this size would have required the most of the graveyard to be dug up to make a hole big enough for it! !